-Unlimited timothy hay. Alfalfa can be given as a treat, but only rarely..
-1/8 cup of pellets a day, per Chin. Usually if the Chinchilla is getting unlimited timothy hay, we give them alfalfa pellets to balance everything out. -Do not go cheap with pellets; they are very important for nutrition. DO NOT buy pellets with nuts, seeds or fruits in them as they are very bad for Chinchillas. -Our Chinchillas get the occasional treat of fresh veggies (very small pieces so they do not get diarrhea). -As large as possible plastic bottomed cage, preferably with multiple levels for climbing. -Bedding should be aspen or unscented recycled newspaper (carefresh). 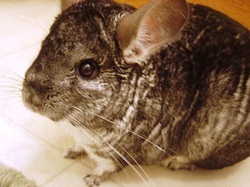 Cedar and Pine should not be used, oils in them can poison a Chinchilla. -Chinchillas require dust baths every 2-3 days. Get a good quality dust bath powder from the pet store. - Chinchillas also benefit from being gently brushed with a slicker brush at least once a week. -Chinchillas can get stepped on and dropped very easily, which is possibly deadly. -Always carry Chinchillas while supporting their rear and their front. 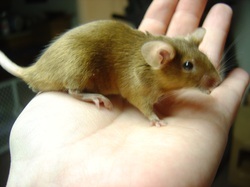 -Mice should have access to water at all times. - Broccoli, peas, green beans, carrots, tomatoes, bananas, cherries, celery, cucumber, apples (seeds removed), etc. -People food can be fed as well, i.e. wheat pasta (cooked or uncooked), cereal (especially cheerios! ), small amounts of cheese, cooked meat, yogurt, oats, etc. -Avoid orange peels, chocolate, very sugary foods, and anything that is unhealthy (processed foods are a no). Always watch for upper respiratory issues, lethargy, or rejection of food. These could indicate a serious problem, and a vet should be seen.